UTAH — For many veterans, the support of therapy animals is life-changing, and for residents at a Salt Lake City veterans home, a baby kangaroo is filling that role. 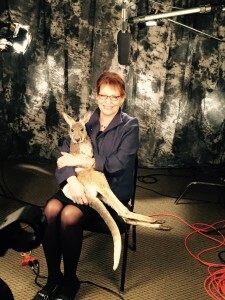 The Utah Red Cross plans to honor the red therapy kangaroo for its service next month. Charlie the therapy kangaroo is one of about a dozen therapy animals at William E. Christoffersen Veterans home and is growing up with the love and support of dozens of residents. The veterans love having him at the home, Rich Woodruff, Red Cross director of communications and marketing, said in a media statement, adding that the impact of therapy animals is well-known, but Charlie has brought an entirely different dimension to the time-tested concept. Charlie weighs 30 pounds, but is expected to grow quickly, reaching about 5 feet 2 inches and 125 pounds. That means he won’t be able to stay in the veterans home much longer. Noralyn said when kangaroos reach puberty, they become more aggressive. In Charlie’s case, he will be re-homed to a farm environment to live out his remaining days but, for now, he is one busy Kangaroo. The Utah Red Cross will honor Charlie and veterans home administrator Noralyn Kahn in March at its annual Heroes Recognition event.